Make a difference and... have fun doing it! At this year?s event, we?ll be roasting one of Tucson?s finest: Mayor Jonathan Rothschild! Molly Rothschild will serve as the Master of Ceremonies. Dave Fitzsimmons, Elliot Glicksman and Isaac Rothschild are our brave roasters. Don?t miss out on this entertainment! Ticket information is coming soon. Stay tuned! 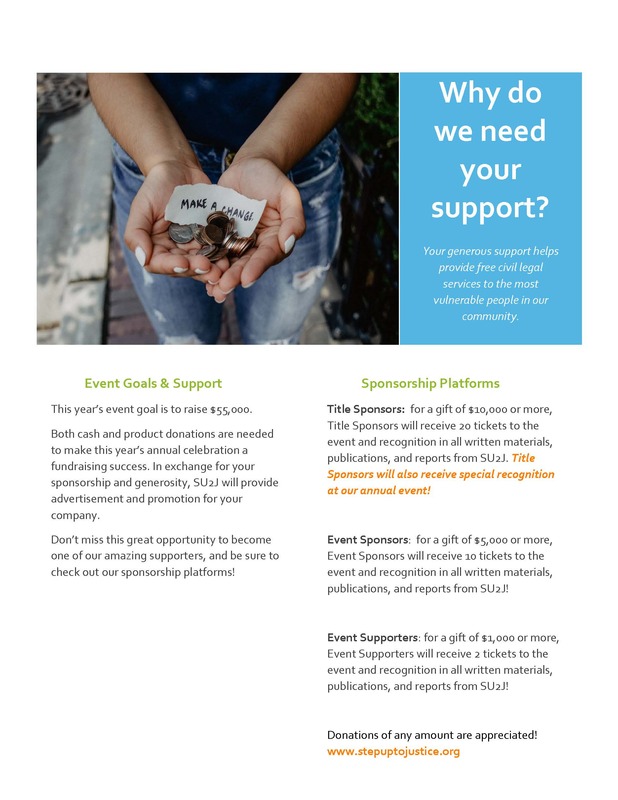 Sponsoring Step Up to Justice in our 2nd annual celebration provides you the unique opportunity to connect with the Tucson community at large, to build brand awareness, and show your company?s support for an important cause: expanding the reach of pro bono civil legal services! Looking for an opportunity to become a part of one of our biggest events of the year? Want to show your dedication to our local Tucson community? Then consider a sponsorship for Step Up to Justice!